G.S & P.A Reeves stock new and used telegraph poles / landscaping poles. A natural timber product ideal for carrying cables, mounting closed circuit cameras, farm gates and landscape gardening. Telegraph Poles create an ideal natural timber bollard to restrict traffic or create a boundary. 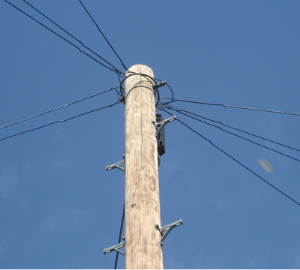 Telegraph poles provide an eco friendly manner in which to create easy access of power, telephone and data cables across farms and estates. We stock both new and used telegraph poles in a variety of lengths from 6m. Our new telephone poles are pressure treated and provide an ideal natural material with which to create children’s play areas, recreational furniture for parks and pub gardens. 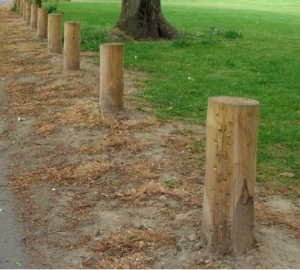 Telegraph Poles create an ideal natural timber bollard to restrict traffic or create a boundary. They also provide an easily installed surveillance position for closed circuit television cameras.